We are excited and very proud to welcome the Learning Resource Center to its beautifully remodeled new home in the east wing on the Library’s third floor. After a very ambitious summer-long renovation that resulted in a wall- to- wall transformation of the third floor’s east wing, the Learning Resource Center (LRC) is happily settling into its new digs in the Oviatt Library. 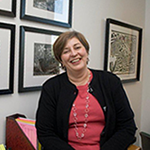 Associate Dean of the Oviatt Library Marianne Afifi is required to wear a variety of hats. Now, after overseeing months of construction in the new Learning Commons, a hardhat is included. 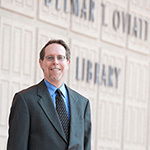 On the long list of responsibilities that fall under the purview of the Oviatt Library’s Associate Dean Marianne Afifi are things like day-to-day operations, emergency planning, departmental oversight, strategic planning, and development. 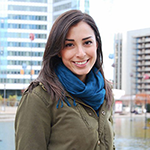 Originally from Orange County, Sarah began to work at the Oviatt Library in November 2012 after completing her Bachelor of Architecture at California Polytechnic State University, San Luis Obispo. While pursuing her degree, Sarah worked as a Learning Commons Assistant in Cal Poly’s Robert E. Kennedy Library, as well as a Computer Lab Assistant and in the Architecture Department. Her experiences in the library eventually helped Sarah to select library design as the basis for her senior thesis project. 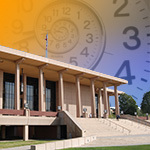 With an ever-increasing number of resource materials, new modes of access, and an expanding physical footprint the Oviatt Library’s Special Collections and Archives is more visible and vibrant than ever. A brief summary of last year’s vibrant programming schedule, and a quick glimpse of next year’s event calendar, clearly illustrates why the Oviatt Library continues to stand proudly and steadfast at the bustling crossroads of CSUN’s rich and diverse pedagogical landscape. As 2013 comes to a close, it is a fitting time to reflect on some of the diverse and wide-reaching events that have taken place in the Library over the past year. Side by side Learning Commons Technology and Information Technology bring a variety of new and existing support services for students and faculty to one convenient and centrally located space. 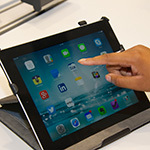 The recently opened Learning Commons is home to a wide range of technology-based support services. And while many of these services were available in the Library’s former layout, they were not always readily apparent or easily accessible. The new, welcoming, open concept design of the Oviatt’s first floor has changed all of that. 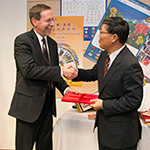 A generous gift of learning resources from the Chinese Consulate to the Oviatt Library is reflective of a well-established partnership that exemplifies CSUN’s expanding role in the internationalization of higher education. 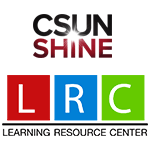 Last summer Professor Justine Su, Director of CSUN’s China Institute, helped to facilitate the donation of more than 2,000 textbooks, CDs, DVDs, and various other interactive learning materials to the Oviatt Library. 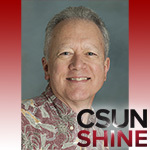 In the season and spirit of giving, we would like to introduce Michael Barrett, a member of the Oviatt family whose very presence has been an inspirational gift to the entire CSUN community for the last four decades. Michael Barrett was born in Bakersfield, California, where he was raised on his family’s farm. After high school, he began his path into higher education close to home at Bakersfield College.